Enormous, epic fantasy role-playing adventure at its finest. 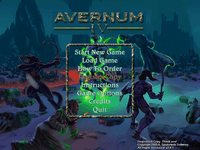 Experience the enormous underworld nation of Avernum, whose shadowy lands are facing horrible peril. Only you can keep your homeland from sliding into anarchy. A gigantic world, with multitudes of characters and hundreds of quests. Epic storyline. Free the cities of Avernum from the madness of the black shades. And keep the citizens from killing you when you try to help them. Exotic enemies, with a wide variety of strategies, abilities, and, of course, cool treasures. Rich game system with dozens of spells, many character building options, and powerful secret skills to unlock. Truly huge game. Almost limitless adventures, dungeons, and hidden artifacts. Experience with previous Avernum games is completely unnecessary to enjoy Avernum 4.